Many potential long term care insurance (LTC) buyers worry they cannot afford or qualify for coverage. Others may want more features such as income or death benefit. Hybrid, or linked-benefits products, can help by giving more flexible alternatives. 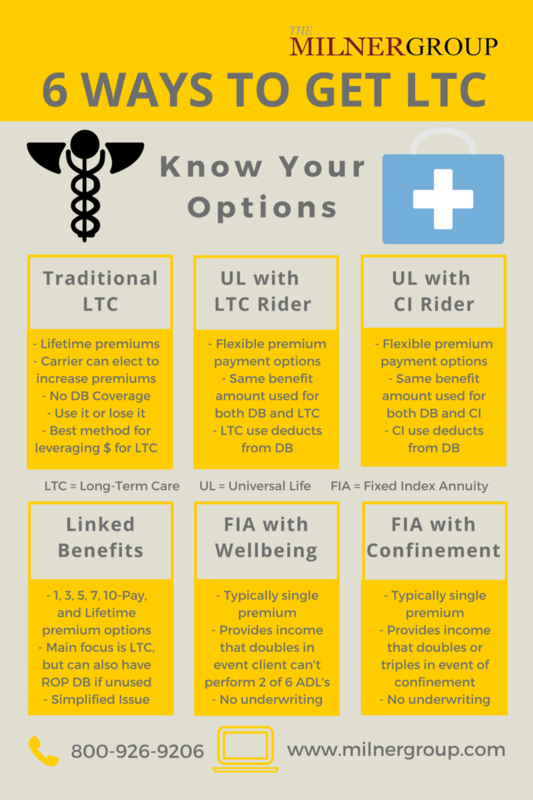 Universal life and fixed index annuities can include riders that provide LTC-like benefits in the event of chronic illness, confinement, etc. This reduces the cost and provides a more lenient qualification process. With so many insurance purchasers moving from traditional LTC to alternative solutions, we would like to help become more familiar with all the options. One of these may be a better choice for your client and knowing what is out there can help you bring more value to them. Generally speaking, anyone between 45 and 70 with assets to fund LTC is a good candidate. To help think through your existing book of business, consider the following categories. Consider one more category – clients with annuities. We have a unique solution for those who are age 80 to 85 and own annuities and you need to know more about this new option. There are options available for people in a variety of situations. Know what those options are and position yourself to capitalize on this market. The Milner Group can help you bring more value to the people you meet with and we look forward to showing you how we can make writing long-term care insurance a little easier.